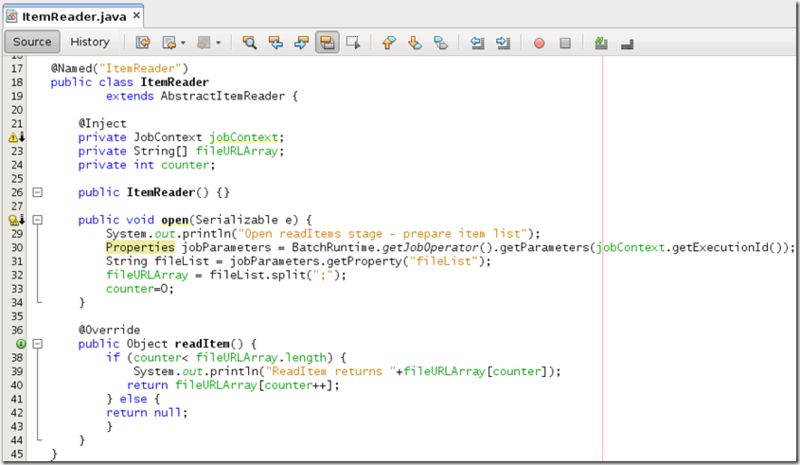 One of the brand new specifications in Java EE 7 is JSR-352 Batch Applications for the Java Platform. This specification describes how Java EE containers will allow applications to run batch jobs in a standardized way. 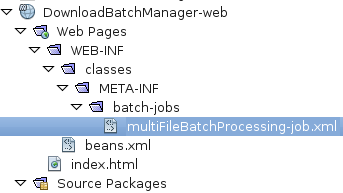 Such a batch job can be scheduled (to be started by the container) or be started as a background process (for example from a Web applications or EJB). 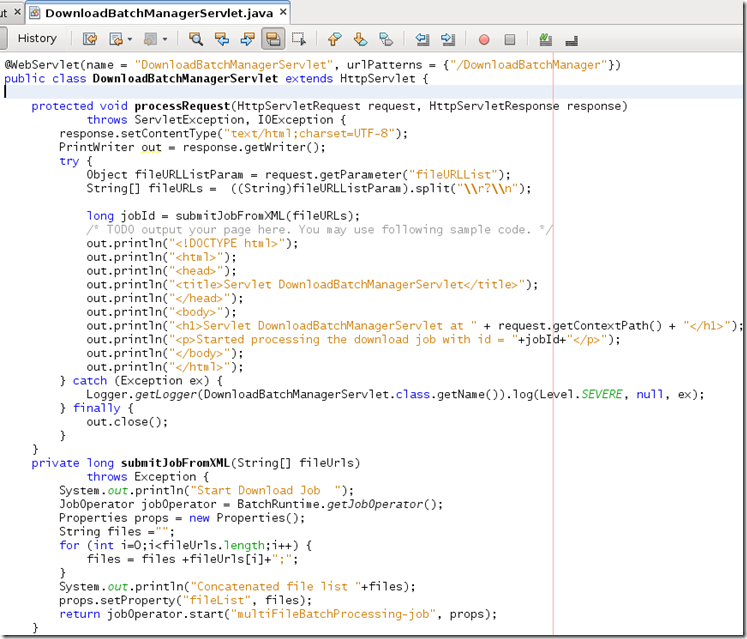 In this article I will show a simple download manager that is implemented using this new Batch specification. The user will enter a number of URLs of files that should be downloaded and gathered into a single ZIP-file. 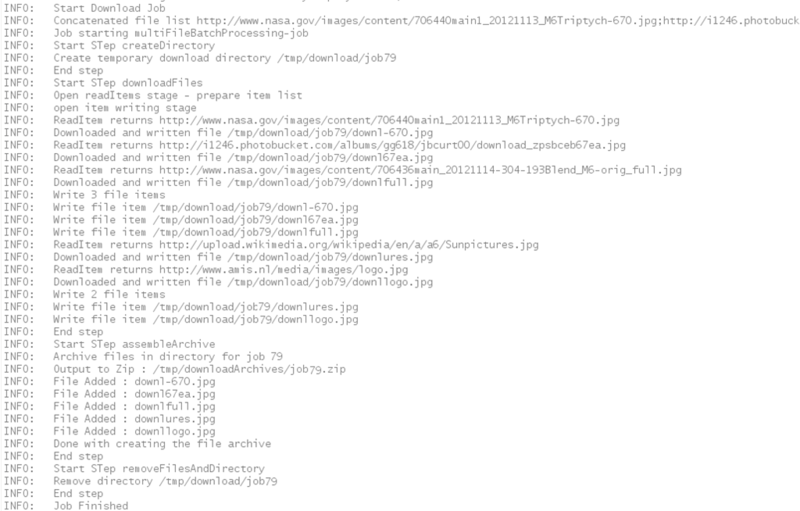 An HTML page submits the list of files to a Servlet. The Servlet starts a batch job (that runs in the background) and returns to the browser with the identifier of the background job. 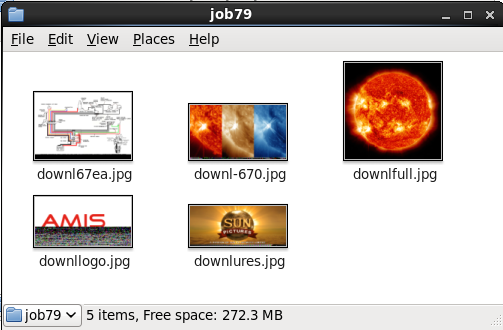 The batch job meanwhile will go through a number of steps: create a temporary directory, download all files, create a zip-file, add all downloaded files to the archive and finally remove the temporary download directory. 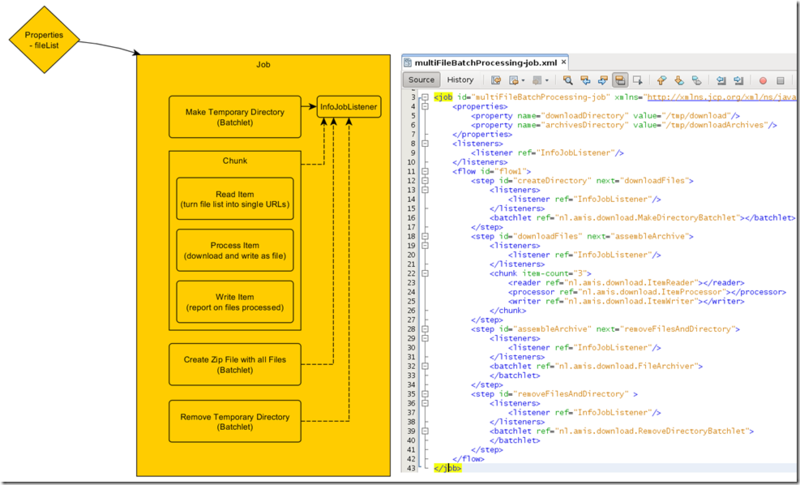 This example will show a number of the mechanisms and features of the JSR-352 specification, including chunked processing, parameter passing, batchlets, job and step listeners, the creation of the JSL based task definition and the initiation of the task from a servlet. 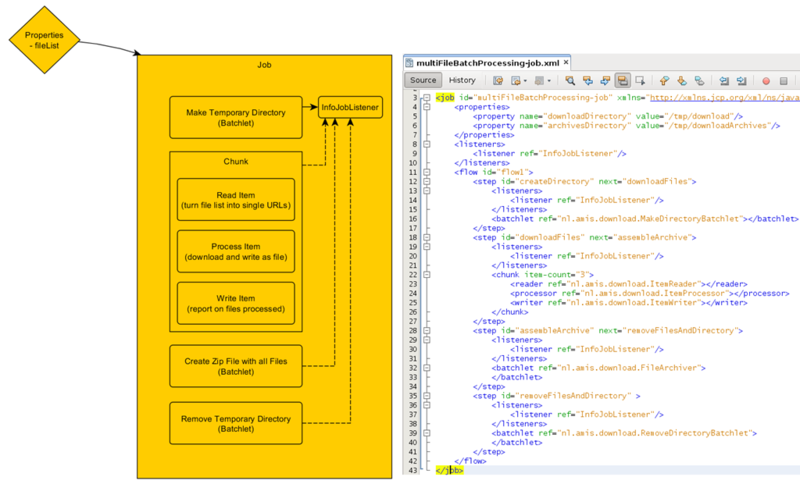 The batch job is specified in an XML document, using the Job Specification Language. In this document, the step by step execution path for the job is given – detailing the order of the steps, decision & flow logic determining whether steps should be executed or not and advising the job execution engine on which steps can be processed in parallel. 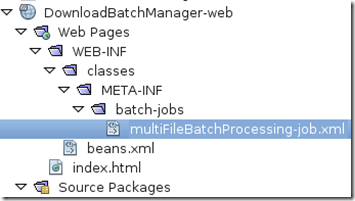 For each step, we specify which classes or managed beans should be invoked to perform the actual work. 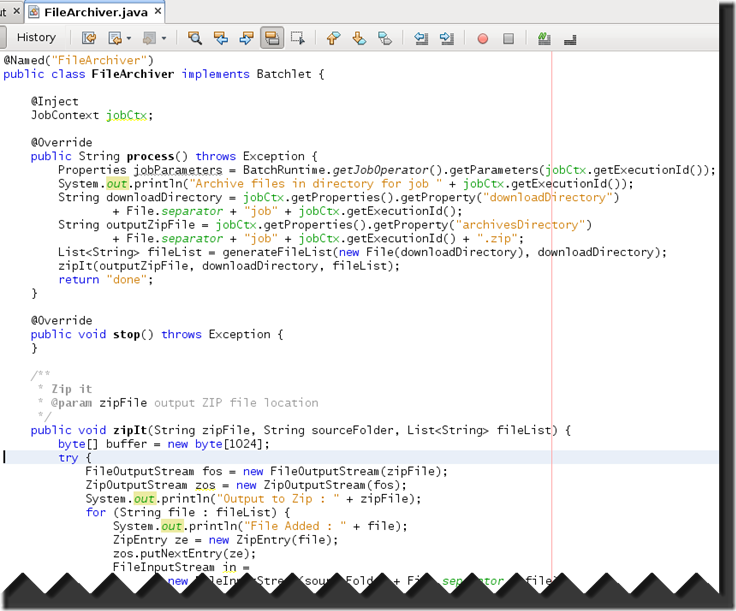 As such, the JSL has many similarities with for example BPEL. 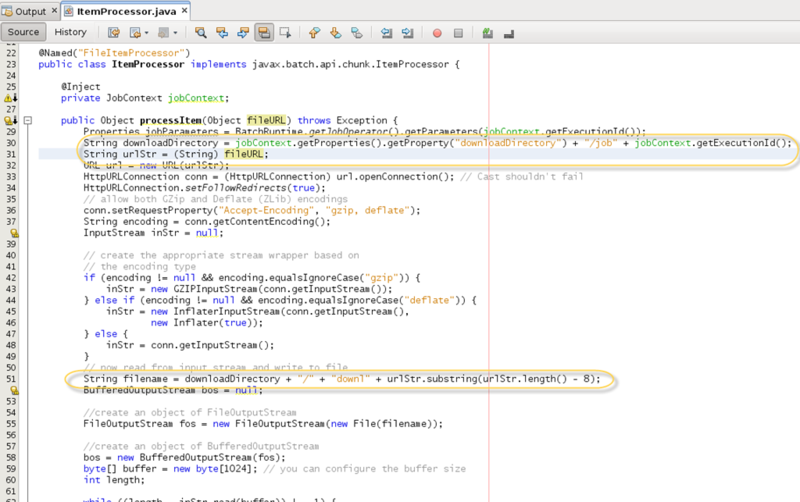 The CDI annotation @Named is the link between the ref attribute in the listener object and the class InfoJobListener. 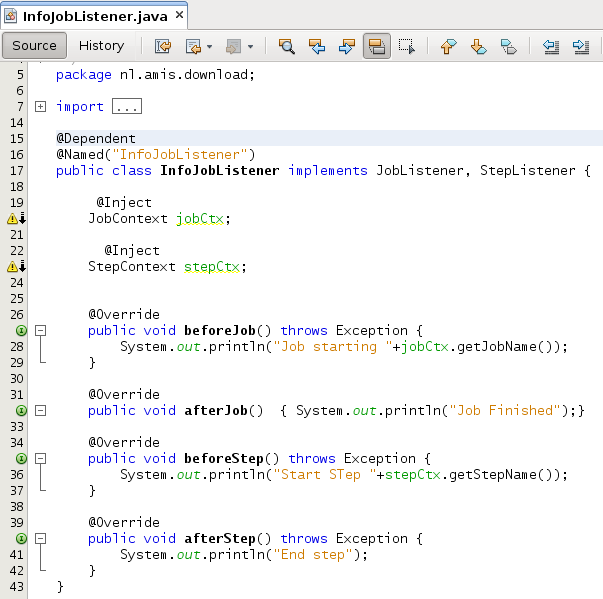 The class implements the interfaces JobListener and StepListener defined in the Batch Programming specification. 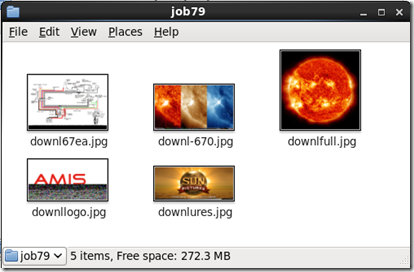 The job specification language also contains two properties – downloadDirectory and archivesDirectory. 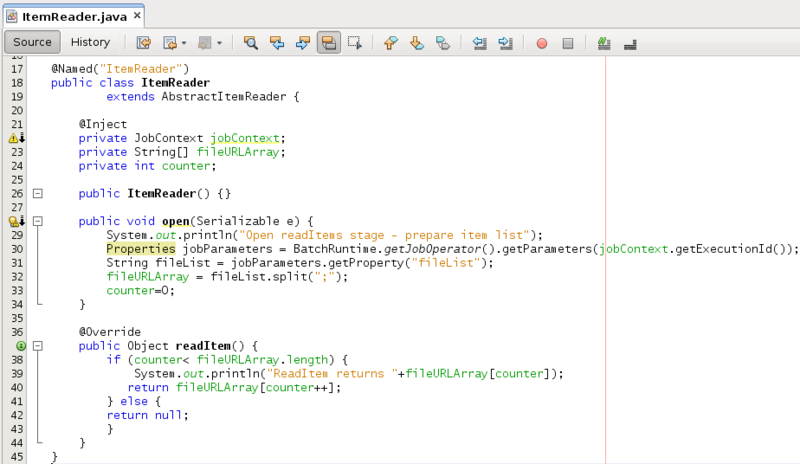 These properties can be access from the JobContext object in each class that is enlisted to be a batchlet or a chunk reader, writer or processor. The properties are used to specify the directory in which the temporary download directories can be created as well as where the final download archives (the zip file produced by the job) should be written to. The chunk step is next. This step consists of three stages: read, process and write. Three classes perform these stages: ItemReader, ItemProcessor and ItemWriter – extending AbstractItemReader, implementing ItemProcessor and extending AbstractItemReaderimplementing respectively. Class ItemReader has an open method that performs the initialization for the per item iterations that will follow. In open(), the string property fileList – passed in when the batch job is started – is split into a String Array and a counter variable is reset. processing the item (represented by the fileURL) consists of opening a URL object to the file, creating a new file in the temporary job download directory, reading the content from the URL and writing it to the new file. 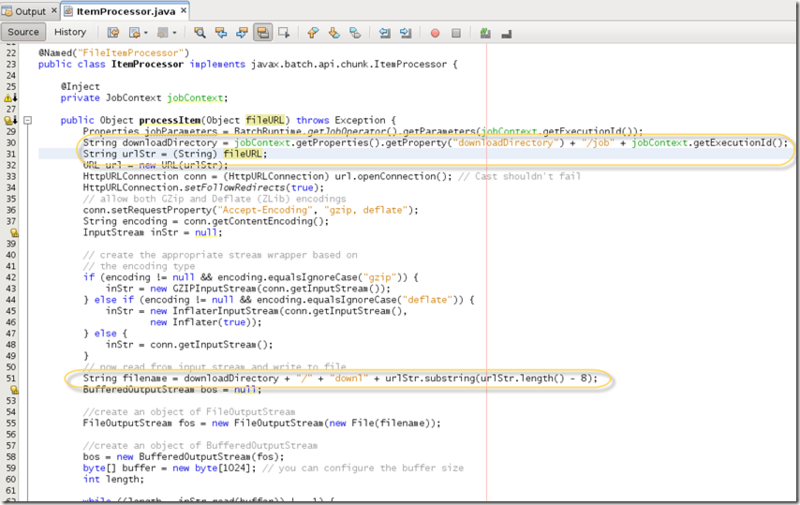 Most of the code is pretty standard Java I/O processing and stream handling (for which I googled around freely). 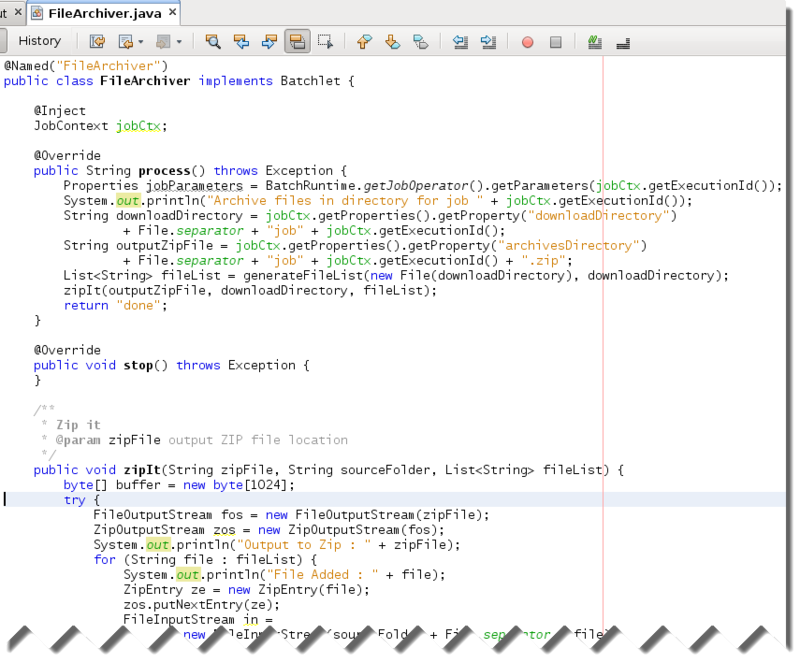 Again, the property for the download directory as well as the Job Execution Id are retrieved from the Job Execution Context that is injected. The final result from the ItemProcessor is the name of the file that was written. This result is returned to the Job execution engine. 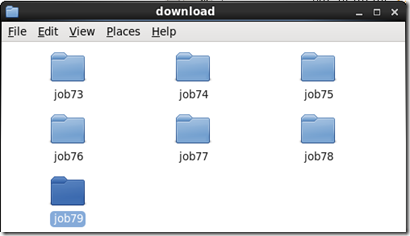 The last step is the batchlet that removes the temporary directory. The download batch job is to be invoked from a servlet. 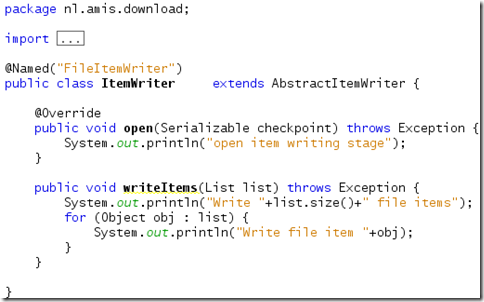 The servlet is accessed through a POST request that contains a parameter – fileURLList. This parameter contains URLs from which files should be downloaded. These URLs are separated by linefeeds. 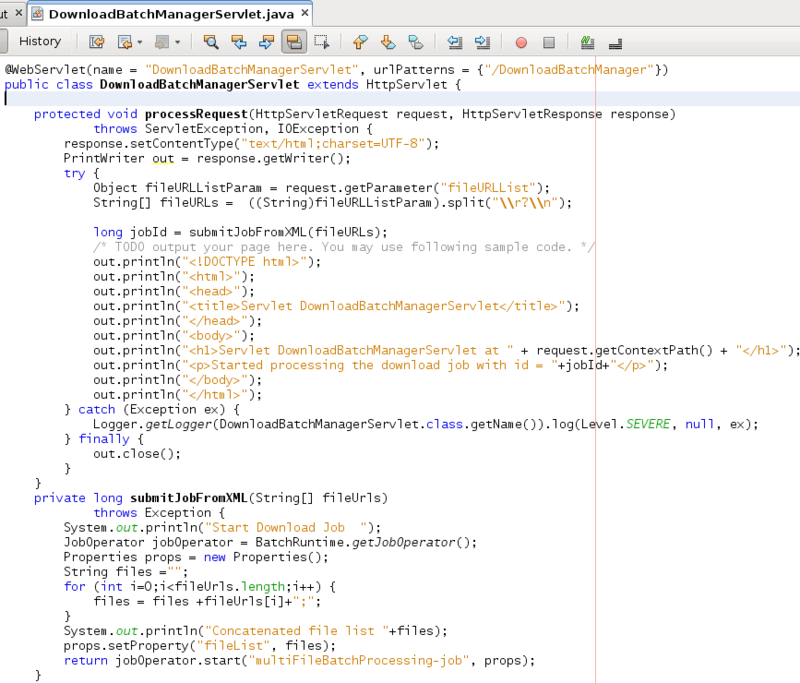 Download the NetBeans project with all the sources discussed in this article: DownloadBatchManager-web. 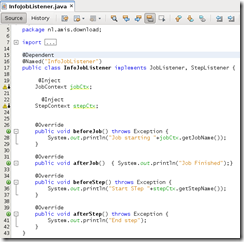 Java EE 6 and GlassFish 3.0 released! Nice post, Batch jobs are really nice framework in Java EE, but is it possible to switch default batch job database to for example mysql? I did not found nothing about it on google. Great post, a good intro to the respective API parts. One small thing I noticed though… You ought to synchronize access to the counter in the ItemReader if you want to support parallell multithreaded reads. Otherwise a great post! Thanks for the post. I have a question regarding the flow. 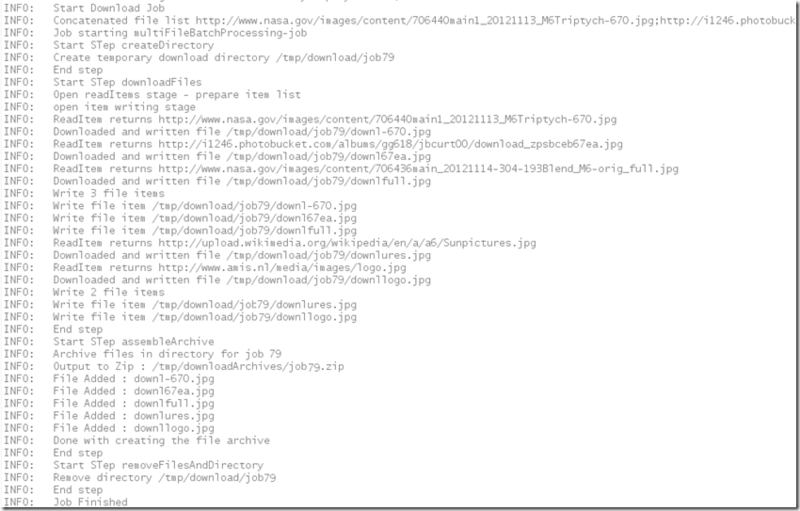 The 3rd step get the list of files reading the output directory. 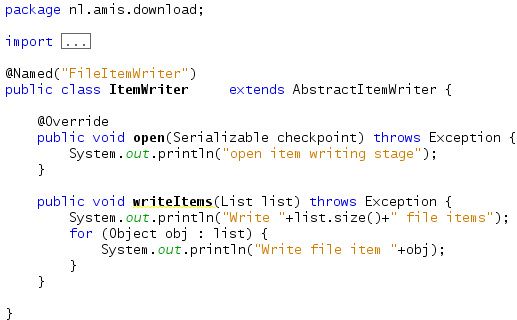 I guess this list could be passed by the 2nd step, that generates all the files, isn’t it?